leukemia presenting as a severe bleeding disorder, with infiltration of the bone marrow by abnormal promyelocytes and myelocytes, a low plasma fibrinogen, and defective coagulation. a malignancy of the blood-forming tissues, characterized by the proliferation of promyelocytes and blast cells with distinctive Auer rods. Symptoms include severe bleeding and bruises. The patient may also have a low fibrinogen level and platelet count. Management of the disease typically requires replacement of coagulation factors and administration of cytotoxic drugs. See also leukemia. Oncology A type of leukemia that comprises 10% of AML, which has a poor prognosis in children Clinical Presents with bleeding diathesis—fatal in 8-47%, due to chemotherapy-induced thrombocytopenia and hypofibrinogenemia Management Induction with all-trans-retinoic acid, followed by conventional chemotherapy, commonly an anthracycline plus cytarabine. See Retinoic acid syndrome. The disorder presenting as a severe bleeding disorder, with infiltration of the bone marrow by abnormal promyelocytes and myelocytes, low plasma fibrinogen, and defective coagulation. Leukemia as a severe bleeding disorder, with infiltration of the bone marrow by abnormal promyelocytes and myelocytes, a low plasma fibrinogen level, and defective coagulation. A PML/RARA chimeric gene on chromosome 12 in a patient with acute promyelocytic leukemia (M3) associated with a new varient translocation:t(12; 15; 17)q24; q24; q11). Rapid and reliable confirmation of acute promyelocytic leukemia by immunofluorescence staining with an antipromyelocytic leukemia antibody: the M.
Enhancement by bufalin of retinoic acid-induced differentiation of acute promyelocytic leukemia cells in primary culture. Indeed, one of the first examples of targeted therapy was the selective use of all-trans-retinoic acid in acute promyelocytic leukemia. Evidence for a 15,17 translocation in every patient with acute promyelocytic leukemia. Prolongation of the QT interval and ventricular tachycardia in patients treated with arsenic trioxide for acute promyelocytic leukemia. A case of therapy-related extramedullary acute promyelocytic leukemia. Mi JQ, Li JM, Shen ZX, Chen SJ, Chen Z (2012) How to manage acute promyelocytic leukemia. 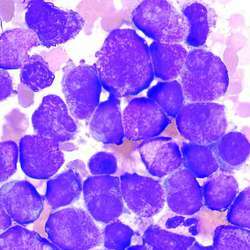 Acute promyelocytic leukemia (APL) is a subtype of AML with a defined clinical course and a biology that is distinct from the other forms of AML. Acute promyelocytic leukemia (APL) is a distinct subtype of acute myeloid leukemia (AML) mainly characterized by specific morphology, leucopenia, and a life-threatening coagulopathy being the most prominent manifestation of the disease (Tallman and Altman 2009). A single center cytogenetic study of 629 Chinese patients with de novo acute myeloid leukemia "evidence of major ethnic differences and a high preva-lence of acute promyelocytic leukemia in Chinese pati-ents. The inclusion criteria were as follows: age 18 to 60, de novo AML according to French-American-British (FAB) classification  (Table 1) (excluding acute promyelocytic leukemia M3), achieving complete remission (CR).